These 2" Kokanee flies have performed legendary! These come rigged right out of the package on a 15lb leader with a smiley blade and two double stack size 4 hooks. 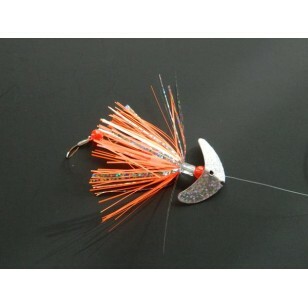 WE TIE THIS FLY TOGETHER WITH 15LB LEADER WITH GLOW BEADS AND A SMILE BLADE, THIS IS SURE TO GIVE YOU SOME TIGHT LINES. THE ORANGE CRUSH SUPERFLY WORKS EXCEPTIONALLY WELL WHEN PULLED 12"-24" BEHIND A DODGER/FLASHER FOR KOKANEE, TROUT AND COHO.